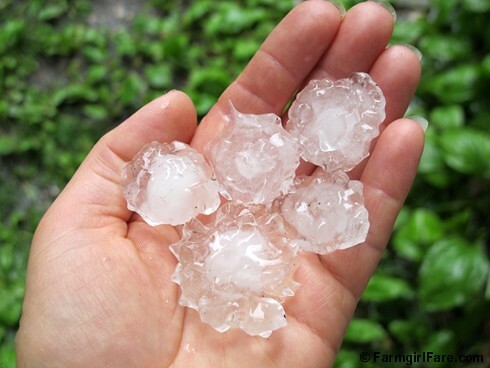 We often have large hail predicted during warm weather thunderstorms, but it usually never materializes. Today it did, starting out small and quickly increasing in size. I've never seen hail this big before—and look at those spikes. Very cool. © FarmgirlFare.com, where today's storm also brought a nice little drop in temperature—and some really loud pounding on The Shack's uninsulated old tin roof. They look like ice rosettes! Hey.. if it is gonna hail.. it may as well be stylish! I hope your garden survived! We're having "feels like" 123F right now, so the boys were thinking the hail would be a good idea :) Even so, we keep hearing about all loss in your part of the world; we're hoping you and all the critters are safe and sound. Wow, that’s some strangely shaped hail and big enough to hurt if you are standing in it. Run, run for the hills. no, wait, that’s not right !~! Whoa! That is cool (pun intended). Pour yourself a glass of lemonade and drop a few in? Heh. Hey. Just wondering if you happen to know any other farmers or bloggers in Western North Carolina, or North Eastern Georgia? We're having that weird weather too, but it seems like it might be finally starting to warm up! Glad to hear you're safe, as I know there were a few tornadoes in southern Missouri again yesterday. There were a few up by us near the Columbia area, and even baseball sized hail in metro St. Louis! Almost makes me look forward to the 90 degree temperatures and 100% humidity of June and July.